You might not know it, but your favorite fiery red sauce is available in dry form. That’s right! Sriracha powder delivers that signature tangy red chili, garlic and vinegar flavor you know from the sauce, but with a tamer heat and a fruitier taste. Sriracha powder is great for giving a kick of garlic, smoke and spiciness to sauces, dips and, really, just about any dish. If you love Sriracha sauce, you’ll be a fan of our house-blended Sriracha seasoning. Dry Rubs – Sriracha powder’s tamer heat provides a sweeter spiciness, as well as tangy salt flavor. Finishing Spice – Use it as a more flavorful and spicier substitute for paprika. It’s great on scrambled eggs, popcorn and deviled eggs. Flavor Enhancer – Sriracha goes well in simmering stews, sauces and dips. And it can be blended in cold or hot dishes. It’s perfect for a dash of heat in ramen and other Asian soups. A pinch of Sriracha can go a long way, and it’s a somewhat volatile spice. Add it when you’re nearly finished cooking for a bolder, fresher flavor. Sriracha is a sauce that’s made from red chilis, garlic, vinegar, salt and sugar. And it’s popular in Thailand and Southeast Asia. The sauce is named after the town of Si Racha, a coastal Thailand port where the sauce is thought to have originated. (Although the origin of the sauce is hotly debated.) There’s even a Si Racha Lover’s Association, which suggests the sauce was first produced by Burmese laborers in the early 1900s. The sauce wasn’t introduced in the U.S. until the 1980s. Huy Fong Foods, a California-based food producer created the first “rooster sauce,” which is now ubiquitous in U.S. gourmet kitchens. In Thailand and Vietnam, Sriracha is a favorite dipping sauce for seafood, and it’s commonly used to flavor pho, fried noodles and spring rolls. The chilis used in Sriracha are traditionally red jalapenos. The red jalapenos ripen longer on the vine than green jalapenos. And as they mature, the red peppers increase in heat. That’s where the sauce and powder get their signature spiciness. 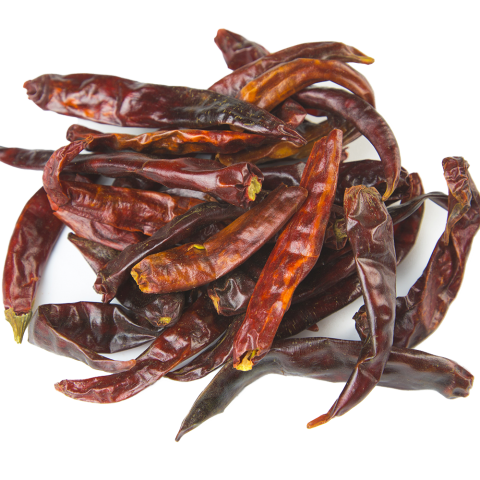 In addition to red jalapenos, sugar, salt, garlic and vinegar are the other predominant ingredients. Some regions in Asia have their own unique recipes for the sauce. In Thailand, for instance, more vinegar is used, which renders a runnier and tangier sauce. Our house blend features a bit of vinegar, as well as natural jalapeno heat, and it’s closest to the Thai-style sauce. Burma Spice has created its own special blend. Our sriracha powder features a blend of Mexican-grown red jalapenos. We source them and dry, deseed and destem them in our spice shop. We also crush and sift the peppers along with the other ingredients, and sift the powder by hand. Our sriracha powder has a yellowish orange color, and we’ve found our blend to have a tangy, milder heat. With the powder, you get more of the fruitiness from the peppers than you do from the sauce.